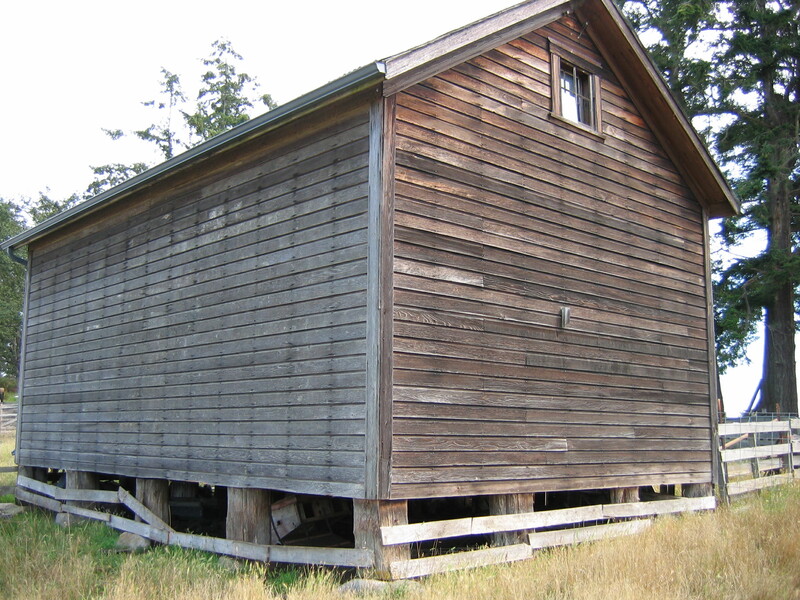 Originally grain was stored on one side of a center drive barn, in bins adjacent to the threshing floor. However, in order to keep vermin away from the grain, separate structures—granaries—were constructed in a ‘tight’ manner with few windows and usually just one door. These buildings were elevated on wood posts or piers in order to remove the floor from contact with the moisture in the ground and prevent access from vermin such as mice and rats. The walls are often sided both inside and out, again to prevent animal incursions, although some structures were sided only on the inside of the structure, resulting in what has come to be known as an “inside-out” structure. The floors, usually consisting of a (diagonal) subfloor with tongue-and-groove or lapped flooring on top, were also tightly sealed. On the inside, there were either bins for the storage of loose grain or separate areas for stacked bags. The capacity of a granary is calculated in bushels; each bushel contains about 1.25 cubic feet. (A bushel is equal to 4 pecks, and 1 peck equals 2 gallons). So a space 10 feet by 10 feet by 10 feet (1000 cu ft), for instance, could contain about 800 bushels.